President Obama recently invited French President Francois Hollande on a tour of Monticello, Thomas Jefferson’s plantation estate in Virginia. Jefferson—No. 3—was not the only slaveowning president. As Clarence Lusane, professor of political science at American University writes in his book The Black History of the White House and talks about in this interview with Amy Goodman on DemocracyNow!, six of twelve slave-owning presidents kept slaves in the White House. 150 years ago, on November 19, 1863, the United States of America were in the midst of a bloody civil war that would test whether the American project would endure. During the summer of 1963, the slave states of the Confederacy had gained the upper hand, or so it seemed. Abraham Lincoln’s brief speech, held in the small town of Gettysburg, Pennsylvania, where just a few months earlier, a bloody battle had left thousands dead and many more wounded, addressed the question of America’s future as a nation. [f]our score and seven years ago [eighty-seven years ago, in 1776,] our fathers brought forth on this continent, a new nation, conceived in Liberty, and dedicated to the proposition that all men are created equal. Historically, of course, there was a mismatch between the ideal of a new free nation and the reality for several segments of the population. In the beginning, liberty was something to be enjoyed by white, propertied men (“all men” meaning ‘not women’). The expansion of white settlements across the continent entailed the genocide and marginalization of Native American peoples. The existence of chattel slavery contradicted the national self-image of America as a bulwark of liberty, as was pointed out with cutting precision by abolitionists like Frederick Douglass, for instance in his brilliant 1852 speech “What To The Slave Is The Fourth Of July?,” held eleven years before Lincoln’s. That said, the issue of slavery had become central to the continuing existence of American nation. And while Lincoln had not planned to abolish slavery altogether prior to the Civil War, but only to stop its expansion, as can be read in his 1861 inaugural address, abolition would come about as a consequence of the war. The brave men, living and dead, who struggled here, have consecrated it [the improved cemetery on the battlefield] far above our poor power to add or detract. [. . .] It is for us the living, rather, to be dedicated here to the unfinished work which they who fought here have thus far so nobly advanced. It is rather for us to be here dedicated to the great task remaining before us — that from these honored dead we take increased devotion to that cause for which they gave the last full measure of devotion — that we here highly resolve that these dead shall not have died in vain — that this nation, under God, shall have a new birth of freedom — and that government of the people, by the people, for the people, shall not perish from the earth [emphasis mine]. Lincoln appeals to the Union army by encouraging them to protect the American form of popular government, or at least the ideal of what it could be. One and a half years later, in April of 1865, Lincoln was assassinated. In June of 1865, the Civil War ended. The estimate of the number of military casualties is about 750,000. Combined with civilian deaths, it goes up to one million. In retrospect, the Gettysburg Address is generally seen as a turning point in the Civil War and remains one of the most famous political speeches in American history (and with a length of only about two minutes, a really short one, as well). President Obama recited the Gettysburg Address as one of many public figures after being approached by documentary filmmaker Ken Burns. As The Raw Story reports, he used an early version that did not yet include the words “under God,” as in the version I quoted further up in this blog post. Because of this, the conservative outrage machine has thrown a temper tantrum. This nontroversy is of course ridiculous. Firstly, because Obama just did an accurate reading of one specific version that just does not contain those words. Secondly, because in a secular state like the U.S., there are no religious tests as a requirement for public office. Despite all this, the social reality in today’s American politics is extremely contradictory to this fact. To be elected to political office, one basically has to pay lip service to being religious, and the right kind of religion at that. Protestant Christianity is the default, Catholicism and Judaism is also kind of okay by now, but Muslims are few and suspect, in particular since 2001. But none are more suspect than those who lack the ‘proper’ public displays of religiosity, regardless of context. As a European who thinks that the separation of church and state was the most brilliant idea of the American Founding Fathers (European history is full of theocracies and religious wars), I facepalm. The full text of the Gettysburg Address at American Rhetoric. [Audio] “Putting Lincoln’s Gettysburg Address In its Original Context.” (NPR, 2013/11/19) – Historian Eric Foner explains the Gettysburg Address in the larger context of the American Civil War. 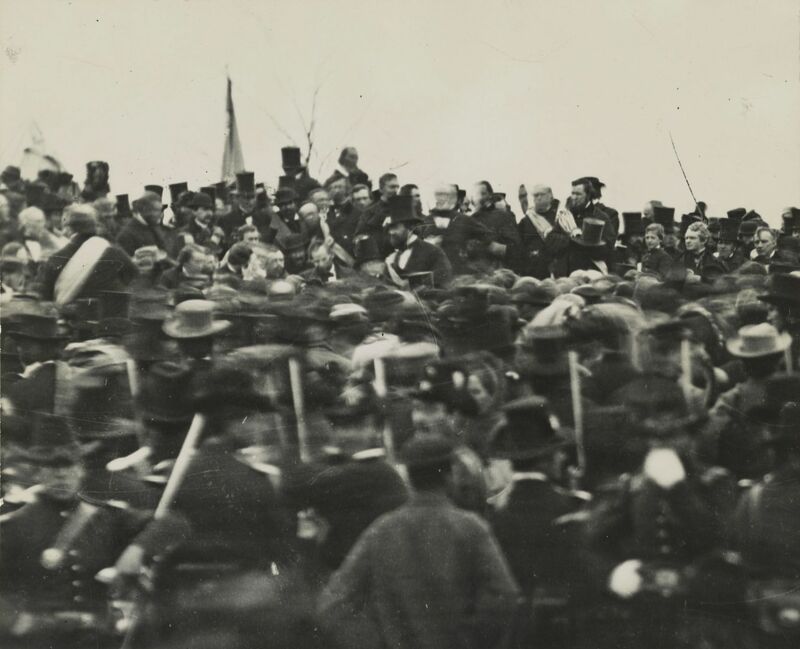 “The Words That Remade America.” (Garry Wills, The Atlantic, 1992/06) – A 1992 essay by Pulitzer- Prize-winning author Gary Wills on the language of the Gettysburg Address. In 1961, the United States Coast Survey created a map showing the distribution of slavery across the US South based on data from the 1860 Census. The map was often consulted by Abraham Lincoln during the Civil War and even appeared in a 1864 painting. via OpenCulture. Please also check out Mike Springer’s longer article on Open Culture. Map Showing the Distribution of the Slave Population of the Southern States of the United States Compiled from the Census of 1860.